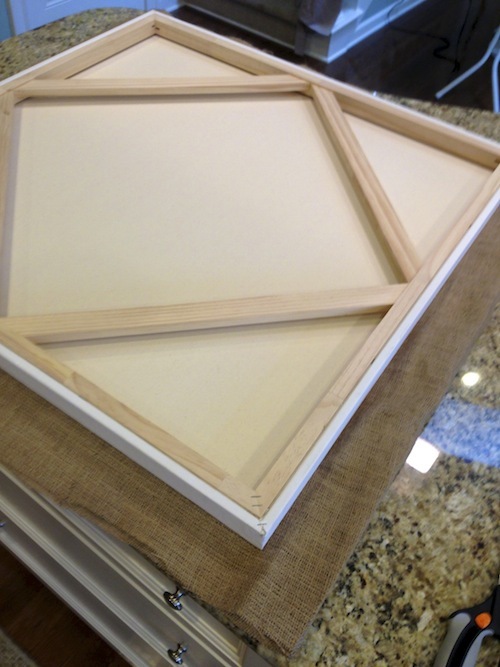 This is a DIY art piece that I put together last week for a client’s master bedroom. We were working on a very tight budget and purchasing a headboard was not an option. I love how this turned out and I thought I would share this simple project with you today. Here are the supplies. It’s a pretty short list and that’s how I like it! 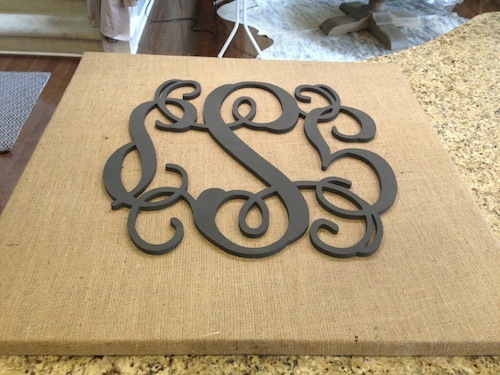 I ordered the custom monogram from Alphabet Boutique 123. You can find them on Etsy. They have many options in many sizes and were wonderful to work with. 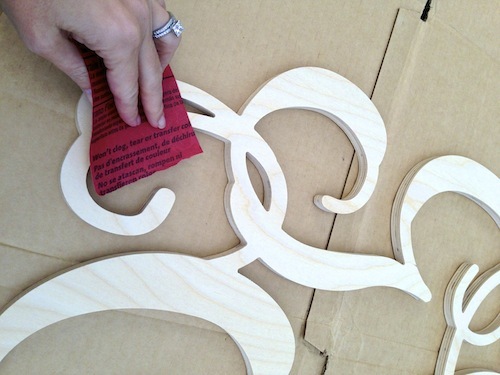 I started by sanding the monogram so that my finish would be smooth. 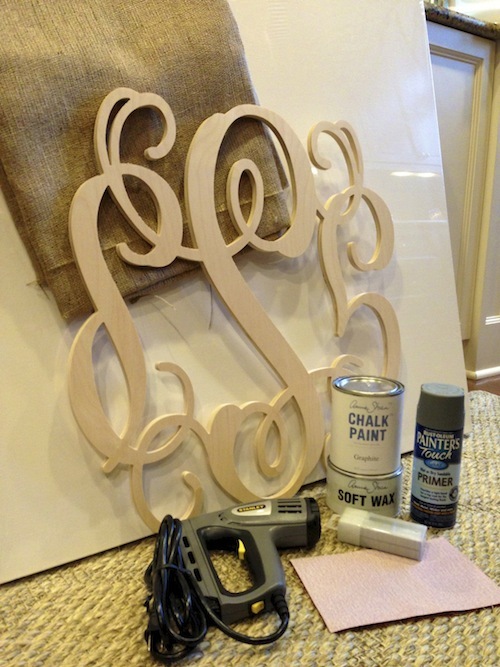 Even though I used Annie Sloan chalk paint and you don’t have to prime, I chose to do so anyway. 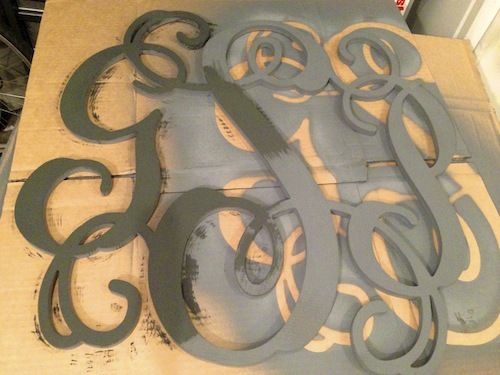 This was raw wood and I felt like the dark gray primer would keep me from using a great deal of the chalk paint. 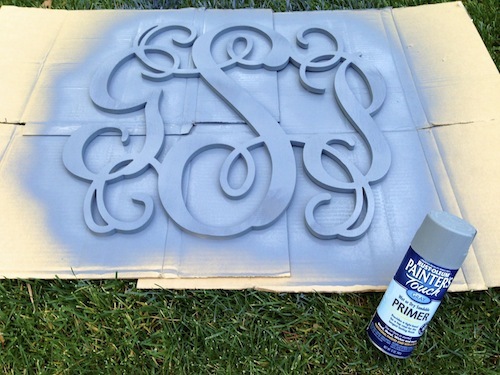 I used two coats of Annie Sloan’s Graphite chalk paint. I did decide not to wax it once I completed the coats. I really liked the matte finish. Next it was time to cover the canvas with burlap. 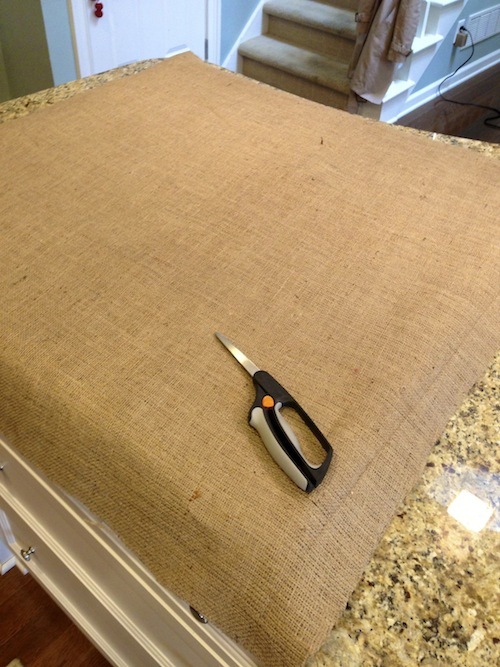 I simply laid the burlap on the canvas and cut it to fit. 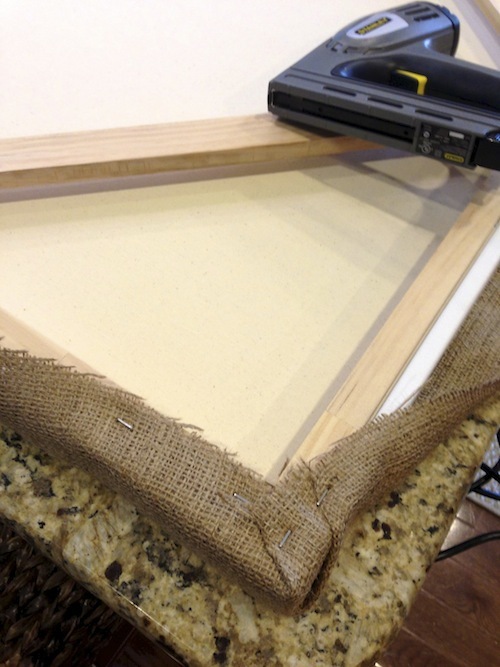 …and stapled the burlap onto the canvas. 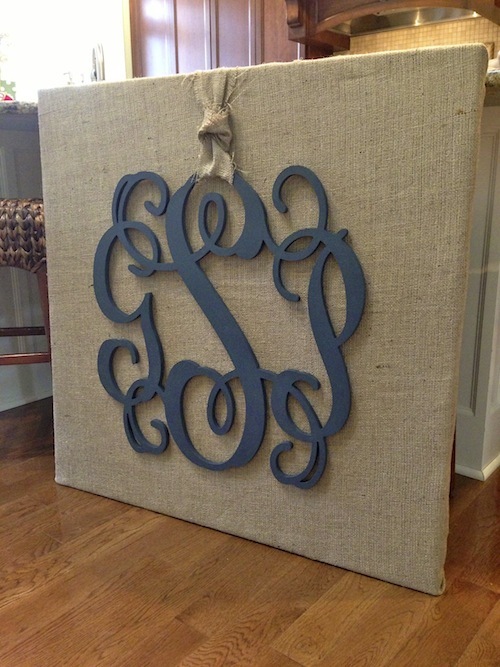 Once the burlap was tight and stapled, I positioned the monogram, cut a ribbon out of the left over burlap, tied it on the monogram and stapled it to the back of the canvas. And there you have it. I’ll share the finished bedroom project soon! As I sit here this morning, it is still pitch black outside and my children are sleeping soundly in their beds. I can’t help but think that there is a mother in Newtown, CT sitting as well mourning the loss of her own child. Of course, I had something different I had planned to share with you today, but it will have to wait for another day. Today is about remembering those sweet children who had their whole lives ahead of them and their amazing teachers who gave their lives trying to save them. It is also, however, about finding a way to protect our children. As I listened to President Obama speak last night at the memorial service in Newtown, he said our first priority is caring for our children. And then he asked a simple question, “Are we doing enough?”. The simple answer, no, we are not. I realize that there are people who will say that there was nothing we could do to prevent this from happening and that sometimes bad things happen. I cannot accept this. My only job on this planet is to care for my children. To guide them, to protect them and to help them as they grow. I do not have all the answers, but I know that this must end. We must join together and find a way to protect our children. If we don’t do this, we will be nothing. As the most powerful nation in the world, I know that this is possible. Yesterday, I read a blog post that touched me deeply. I hope you’ll read it to. The Anarchist Soccer Mom: Thinking the Unthinkable This woman could be any of us sitting at our computers on any given day. Think of your day to day struggles and then try to fathom hers. We must help her child. We must help all the children. It is our responsibility as human beings. As a nation, we are broken. We must start from this day to repair ourselves and worry about what is important. These children who were lost were my children. They were your children. It must be our mission in this life to protect them all.